Full form factor laptops have died a death in the last few months as the new focus of Windows 8 has put the emphasis on portability and hybrids. If it doesn't turn into a tablet, manufacturers don't really want to know, but that's not much use for people who want power, performance and comfort - and that's where the Series 7 Chronos. You may also see it branded as the Samsung Ativ Book 8. 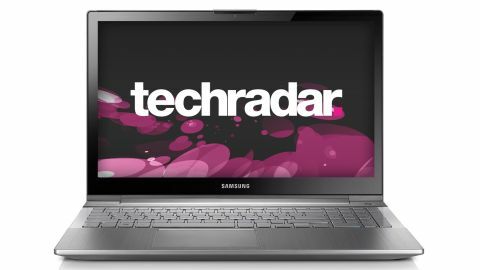 This model is an update to Samsung's premium 15.6-inch performance laptop, which adds a touchscreen to the existing sleek, brushed metal body. It's for anyone who needs true computing power, for running multiple programs and being creative, but who still wants to take advantage of all Windows 8's super new touchscreen features. It's truly a laptop first, unlike other touchscreen alternatives such as the HP Envy x2 or Samsung Ativ Smart PC, which have the innards of a laptop but the form of a tablet. If you're looking for a full-sized QWERTY keyboard and a large screen, the Samsung Ativ Book 8 (model number NP780Z5E) is for you. The expansive display is great for Windows 8, offering a generous portion of your apps at the Start screen, with any press of the Windows key. Having such a big screen means you're able to use more of Windows 8's features, such as the window snapping, so you can use two apps side-by-side. However, the setup highlights the interesting decision made by Acer to switch the trackpad and keyboard on its Aspire R7. The result is that the Samsung asks you to use its keyboard and mouse by placing the device in front of you, and it's awkward to raise your hands across the screen 'zombie-style' to use the touchscreen. The traditional clamshell design of the laptop means it's hard to use in a touchscreen format, and the immobility of the screen is a drawback of the Samsung Series 7 Chronos. A top-of-the-range machine with stunning performance and a super-thin chassis isn't likely to come cheap, and you'll need fairly deep pockets to afford the Samsung Series 7 Chronos. At £1,199/US$1,299 this is a serious outlay, and you're paying for the blistering performance. The irony is that you actually pay twice - firstly with the price tag and then with the added weight, and this means you need to ask yourself a serious question - do you need this power, or would you rather have something to slip into your bag more easily? To help you make this decision, let's review the Samsung Series 7 Chronos in depth. So what's under the hood of this Korean-made beast? Well, the specs are impressive indeed. Firstly, there's an Intel Core i7 3635QM processor chip, which is one of the fastest you'll find out there, clocked at an impressive 2.4GHz. This will handle pretty much anything you throw at it, and is perfect for power-hungry users who want to edit video, images and run rich websites all at the same time. Back that up with the 8GB of RAM that comes as standard and you have one nifty laptop. Intel Core processors are so powerful they can take care of most tasks all on their own, but Samsung has added an AMD Radeon HD 8800M dedicated graphics chip inside too, which does its fair share of work. With dedicated graphics - something you'd never find on a laptop-tablet hybrid - you can run games and HD movies much faster, but the chip can take some of the load off the processor too. You'll find the whole system more responsive, and that's immediately evident on the Samsung Series 7 Chronos. Samsung has added a Full HD 1920 x 1080 panel to the Chronos, which on full brightness is eye-searingly bright. It's got a glossy coating that aids swiping with your finger, but it's incredibly shiny, which could be problematic in bright conditions when working outside or near big office windows. Overall, the Samsung Series 7 Chronos's build quality is superb, especially considering there's so much power harnessed into such a sleek design. The brushed metal oozes class and the laptop opens to reveal an equally metallic chassis, complete with a spacious keyboard and expansive colour-coded trackpad. It's an Aston Martin that's vintage in its design yet fearsome in its execution. Like a classic sports car, it's also heavy, and at 2.5kg (5.4lbs), it's not that portable. You wouldn't want it in your bag all day, and its weight harks back to laptops of old, which were bulky and cumbersome. The sleek lines and thin design makes the weight surprising, and this will be the main turn-off for prospective buyers. By combining great multi-touch features and brilliant accuracy, the trackpad is a triumph, and while we often criticise laptops for low travel keys, the sheer spaciousness of the keyboard makes typing a pleasure. Because this machine evidently isn't designed to be mobile, the connections on offer are more generous than its tablet companions. You get Ethernet, which is music to the ears of regular hotel room hoppers, plus HDMI and four USB ports. There's also VGA and an SD card slot to finish off a sublime port performance.